Depending on the type of the hair and the person's gender, there are many ways to treat Head lice naturally; or you could even try a combination of methods but do each separately. 1- Boys are easy to treat because cutting the hair very short and keeping it short for a period of few months will get rid of them and makes it hard for them to hold on to very short hair. Use it with the combination of the oil and combing method described below. 2- Girls can use a hot hair straightener or a curling iron, to get rid of them for sure because of the intense heat applied. Also all the eggs that are attached to the hair will be killed as well. This may be the quickest and easiest way for girls. It can also be used for boys if hair is long enough. Just be careful not to burn yourself or someone else. 3- Another way is to use quarter of a cup of olive oil, or coconut oil, or even vegetable oil to saturate the hair; the oil prevents the oxygen flow to the head lice breathing which suffocates them. Use a bright coloured tight toothed comb after applying the oil to comb the hair, look in between the teeth of the comb, you might see the head lice sliding easily out of the hair into the comb, because the oil makes it slippery for them to hold on to the hair follicle. Use a tissue to remove them from the comb and continue to comb the hair. Repeat this method every three days for nine days in total (Do not use hair straightener , or hot curling iron at the same time of using oil) Find more details about the olive oil treatment in the previous article post. 4- Mayonnaise works well, but it is not preferred because the vinegar in the mayonnaise makes the hair feels dry afterwards. Following the hair treatment, you might want to vacuum all furniture, floors and wash all the beddings, hats, and all unwashed clothes. All stuffed animals must be placed in tightly closed plastic bags for quarantine for three month period or machine washed. The hair brushes and combs used by this person, must be cleaned thoroughly and or quarantined. The reason you might not want to use insecticide shampoo is because; the skin will absorb the toxins into the bloodstream and end up being deposited into the organs. That is why it is always better to try alternate natural ways first. Mothers don’t panic.... I have been there and done that many times. Kids might have them more than once because of the interaction with other children in schools and daycares. It is very simple... all you need is some olive oil and a shower cap. Let me tell you why this method works and is 100% guaranteed. 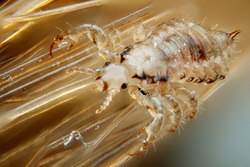 Lice breathe from an opening at the end of their body; when the oil is applied to the hair, the breathing cavity will get plugged with oil, and they die of suffocation. You may not need to wait one hour but it is a precaution to be sure. Lice nit (lice eggs) on the other hand cannot be destroyed. Unless you hand pick them, use a special comb for nits, or apply close heat from a blow-dryer, but this method keeps them attached to the hair. There is a simpler way to get rid of them. The nits hatch within 7 to 10 days, and after hatching they take 8 to 9 days to become adults. So what you will do is use the olive oil treatment ten days later after the first one, this way you make sure none are left behind. Repeat as many times as you feel comfortable, because olive oil also provides shine, and many nutrients to keep hair and scalp healthy. I have always believed in the freedom of self expression and speech, as long as no one living being gets hurt in the process.